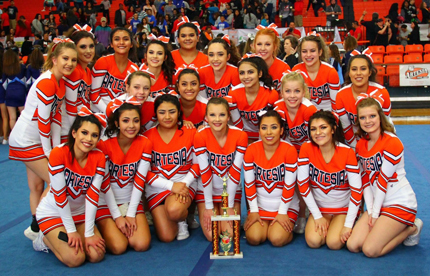 The Artesia High School cheerleaders took second place behind Lovington this weekend at a “game-day cheer” and “dance” competition at Bulldog Pit. A total of 15 teams competed, including Roswell, Goddard, Lovington and Portales. “I’m proud of the way the girls performed in this first competition of the year,” said coach Alysia Tutak, “and excited to work on bettering our performance for the next competition.” That event will be held at 1 p.m. Saturday, Feb. 11, in Lovington, followed by a competition Feb. 18 at Goddard and the state competition March 24-25 at The Pit in Albuquerque. Pictured above are, front row from left, Danielle Lopez, Alex Lopez, Arianna Nunez, Ashly Letcher, Rebecca Baeza, Rebecca Gabaldon, Whitnee Bean, center row from left, Demri Denson, Danielle Martinez, Addison Chavez, Amberlee Cobb, Alyssa Romero, back row from left, Evin Hammond, Logan Menefee, Mina Sanchez, Schyler McCall, Rena Bhakta, Makenzie Reed, Callie Butcher and Sydney Creighton.